It’s hard to believe that Summer is almost over. It seems like it flies by faster and faster each year. Hot temps or not, I am SO not ready to see it go. How about you? If you have a back to school or Labor Day party coming up, then this dip is a great dish serve up. You may even already have all of the ingredients on hand. The only thing I had to buy was the avocados. The other ingredients came from my spice drawer and fridge. 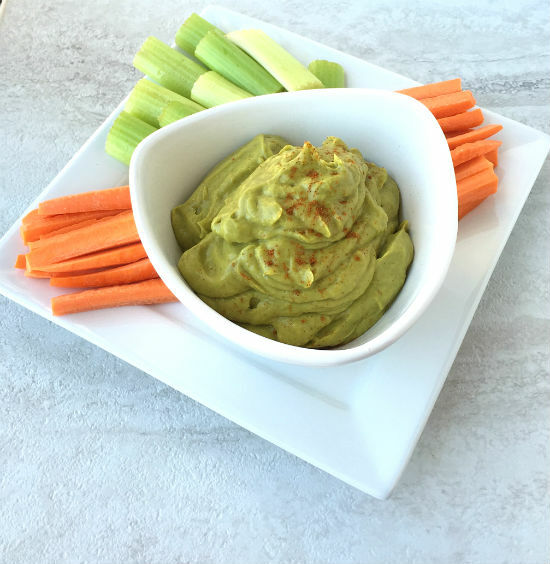 It takes just a few minutes to whip up this Creamy Avocado Dip, which makes it perfect for a party or get together. Sure, you could just go with the standard guacamole recipe, which I love. But the creaminess that the yogurt and food processor gives this is just amazing. I served mine with raw veggies, but you could serve this with chips as well. Whatever you prefer. Oh, it’s also really good on burgers. With pickled jalapenos. Oh yes, I used what I didn’t scarf down at snack time on my burger that evening. So good! You can serve this right away, or put it into an air tight container and let chill for an hour or two. The leftovers were starting to get pretty brown by the next day, so you don’t want to make this too far ahead of serving it. Place all of the ingredients into a food processor (or mini food chopper) and pulse until the ingredients are well incorporated and the mixture is smooth.